From beach balls, to pogo sticks and trampolines, kids of all ages love to play with toys that bounce, and one year olds are no exception. They always find ways to have an absolute blast with toys that help them move around in really fun and exciting ways! With that in mind, we’ve done a ton of research so that we could come up with an awesome list of the best bouncy toys for 1 year olds. Any of the toys on this list make great birthday, Christmas or anytime gifts and are sure to put a smile on your little one’s face. We’ve taken great care to only select the top quality bounce toys so that you can shop in confidence. After looking at a variety of different toys for 1 year olds and considering each toy’s price, durability, and versatility, our number one choice for a bounce toy for a 1 year old is the Fisher Price 3-in-1 Bounce Stride and Ride Elephant. It’s a versatile 3 in 1 toy that is sure to please one year toddlers and parents alike. This elephant has colorful light up buttons, plays 30 songs, has bee on his head, and a roller ball to add to the ways your child can play him. Toddlers love his big red floppy ears made from soft fabric and are fascinated with all the lights, sounds and music. Using this elephant as ride on toy and as walker will help your child develop their leg muscles and gross motor skills strenghtening them to walk without aid and later to run, jump and play. Pushing the light up buttons, spinning the roller ball on top of the elephant’s head, and hitting the bouncing bee can help your child develop their hand-eye coordination and fine motor skills. 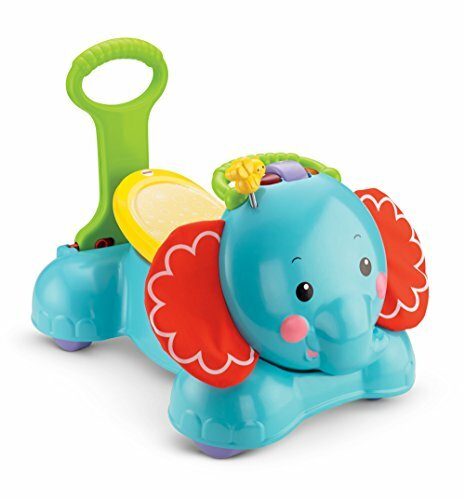 The bouncing aspect of this cute little elephant bounce, stride and ride on toy helps your child improve their balance. The elephant goes from a stationary toy to one that your one year old can bounce on, to a foot propelled ride on toy, to a walker with a handle that will help steady your child’s first steps. Toddlers just love this cute bounce and ride elephant! Easy assembly which parents love! This soft rubber Phthalate Free ToysOpoly Inflatable Horse Bouncer should provide most 1 year olds with plenty of fun. Measuring 23” long with an 11 inch high seat this little bouncing horse comes in Pink, Red, Blue and Green and there is even pump included to inflate the horse. This bouncing horse is designed to help your one year old improve their balance and coordination and to help develop leg, arm and trunk muscles in young children. Parents find that this bounce toy helps their toddler burn off excess energy as they enjoy the bouncing effect of this bouncer, especially once they get it bouncing across the floor. It is also great for children to sit on while watching television. Fun: The next best thing to bouncing on grandpas knee! The Waliki Toys Bouncy Kent Inflatable Rhino is a cute little Pink Rhino that’s PVC and Phthlate Free and comes with a pump to inflate the Rhino. Perfect for one year olds, this bouncing Rhino holds up to 150 pounds. Smaller toddlers can bounce up and down on this bounce toy and slightly larger toddlers can actually get hime to bounce along the floor. Made from extra thick material, it helps your 1 yr old strengthen their legs, arms and trunk muscles, while at the same time helping to improve their overall balance. Fun: Whether sitting and watching television on this inflatable Rhino or hopping across the house or yard, your one year old is sure to have tons of fun riding this cute toy that they themselves control! Makes Exercise Fun: Bouncing on this Rhino will provide your toddler with exercise, helping them to develop their leg muscles. 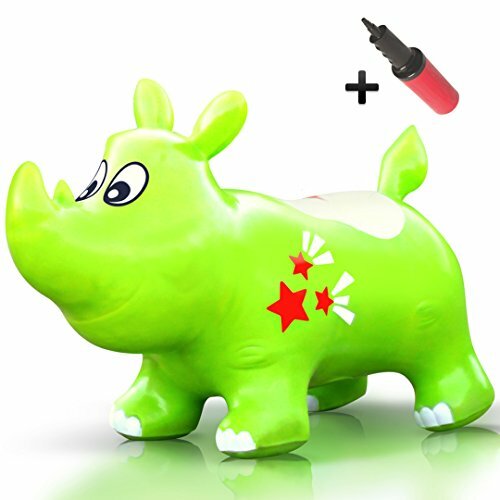 Easy To Inflate And Holds Air Well: Parents like that this Rhino comes with its own air pump and is easy to inflate and holds air exceptionally well. Your one year old toddler is going to love Trumpette Howdy Bouncy Cow and have great fun bouncing around the place on him! He comes in 5 different colors including Black, Grey, Cobalt Blue, White and Pink so lots of great choices for boys and girls. Howdy is really popular with kids as they make up all kinds of adventures they can play with him. He’s a wonderful toy for encouraging imaginative and creative play while keeping your toddler active. Some parents said they did receive a pump to inflate Howdy, but others said they didn’t. But the good news is that even if you don’t receive a pump, lots of parents said he is very easy to inflate. For some, this was the best bouncy toy ever and they said Howdy lasted for several years and is still going strong! 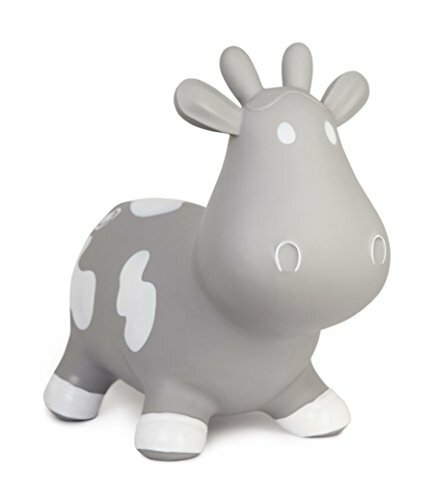 Phthalate Free, with a maximum weight recommendation of 110 pounds, Howdy is a wonderful rubber cow that’s sure to delight your toddler and provide them with hours of engaging fun. Encourages Imaginative Play: Toddlers love creating their own stories and adventures and who better to create them with than Howdy! The Pop And Giggle Pond Pal is a cute little frog with eyes for your one year old to spin and a bouncy little bee for your toddler to bat at. There are also colorful balls in the frogs mouth that bounce around when your child hits a button. This Pond Pal will introduce your toddler to colors and numbers and will play silly songs and music. It measures 20.5” X 5” X12” and requires 4AA batteries for the sound and light up keys. 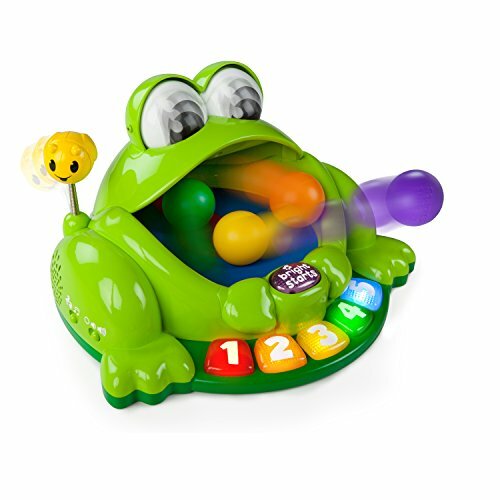 If you are looking to encourage your 1 yr old to do more crawling or walking, then the Pond Pal is the perfect bounce toy as children love chasing after the balls and feeding them back into the frog’s mouth! The Rockin’ Rider Legacy Grow With Me Pony is a versatile bouncing toy that goes from a simple bouncer to a rocker to spring horse. When you press the right ear of this horse, your one year old can hear the “Little Pony Song”. Press the left ear and there are cute phrases and sounds for your little toddler to enjoy. The horse’s mouth actually moves as he sings or talks which adds to the fun of this pony who comes with beautiful embroidered eyes. The seat of the bouncer and rocker measures 11 inches and when you change to the spring, the seat is 18 inches high. 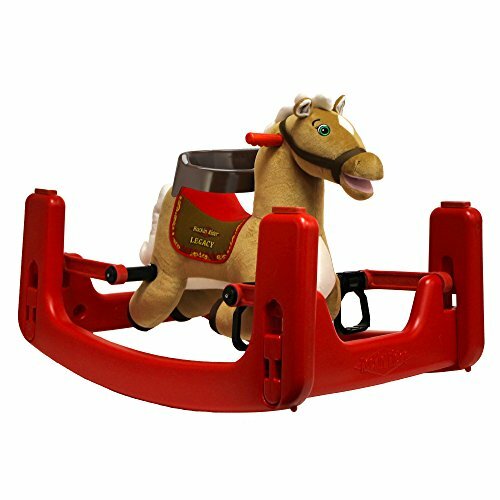 The bouncing horse for toddlers has a motion activated galloping sound that your little one is sure to love. It also comes with a volume control, so your 1 year old can ride the range all day long with driving you the parent nuts! It does take 3AA batteries that are included with the pony. Versatile: With 3 different ways to use this horse, it is a versatile toy that most young children love. Isn’t the iPlay iLearn Hopping Horse the most adorable bouncy horse you’ve ever seen! He is sure to be a huge hit with your one year old toddler who’ll just fall in love with him the minute they see him. Measuring 19.5” X 19.5” X10”, he is made from Phthalate Free PVC and contains no heavy metals. He is covered with a soft touchable material that children enjoy hugging and comes with a pump for easy inflation. This Bouncy Hopping Horse is designed for both indoor and outdoor use. We would suggest though that if you use this horse out of doors, you use him on the grass and make sure that there are no sharp sticks or rocks, as children can actually make this horse hop across an area. This cute Hopping Horse will help your 1 year old develop balance, coordination and stamina, and also gives them a fun way to exercise. Tons Of Fun: Your toddler is sure to have tons of fun riding this horse and imagining themselves riding the range wrangling cows or chasing after buffalo. 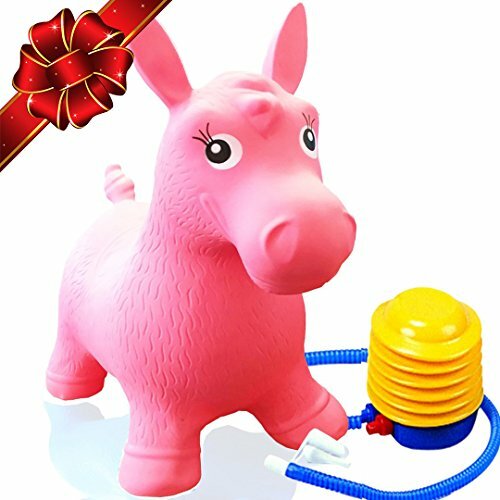 With it’s ears cut long for a better hold, and it’s legs cut short for a better bounce, this Bouncing Inflatable Real Feel Hopping Horse should provide tons of fun for your one year old. 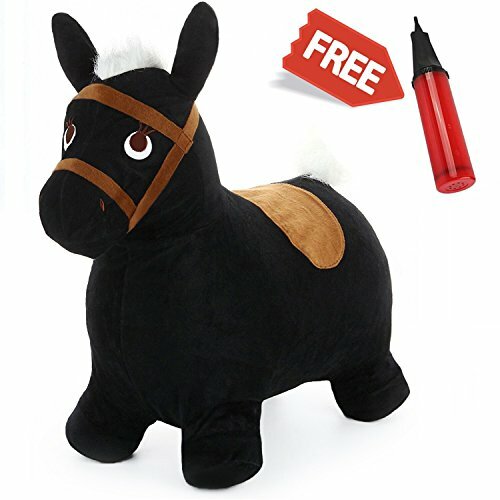 Unlike those plastic feeling bodied bouncing toys, this Hopping Horse has a plush covering that makes him feel “real” to small children, and makes him extremely huggable, as well as more fun to ride. He comes in 3 beautiful colors including Black and Brown, White and Black, and Orange and Brown so some nice choices for your toddler. This horse will help your toddler improve their balance and coordination, while strengthening their gross motor skills. It does come completely deflated, but the accompanying air pump makes it easy to inflate. 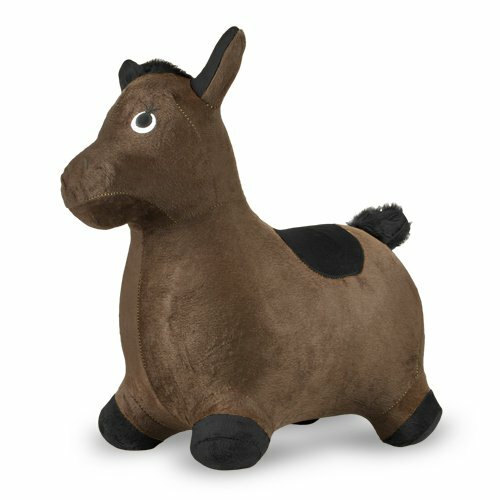 Easy To Inflate: This Hopping Horse is easy to inflate which parents love, especially at Christmas! Plush Covering: Small children love the feel of the horse’s plush covering and think he’s ‘real’! 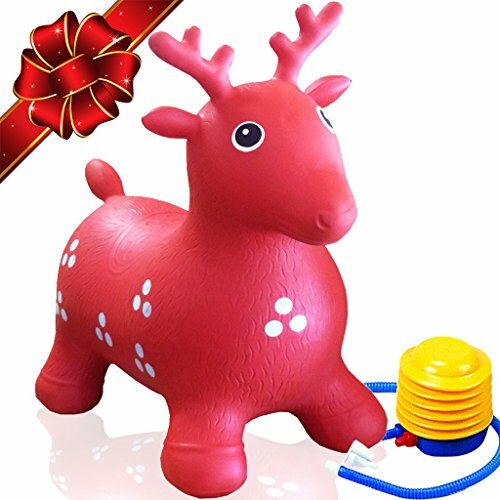 What 1 year old doesn’t love a reindeer thanks to Rudolph, so what would make a better Christmas gift for a small child than this ToysOpoly Ride On Inflatable Reindeer! This cute little big eyed Reindeer comes in your choice of Red, Green, Pink or Blue and is Phthalate Free. It is 23 inches long and the seat is 11 inches from the floor. This inflatable Reindeer is a great way to help your toddler improve their balance and coordination while providing them with a fun way to exercise. It comes completely deflated, but inflating it should be easy since it comes with its own two-way pump. Your one year old will have great fun naming their Reindeer and will enjoy hours of imaginative and pretend play as they go on many adventures with their new buddy. Fun, Fun, Fun! What could be more fun for a one year old toddler than having their own Reindeer ride!